ABC's learning environment with soft, natural earth tones. It's never to early to start learning you're A to Z's. 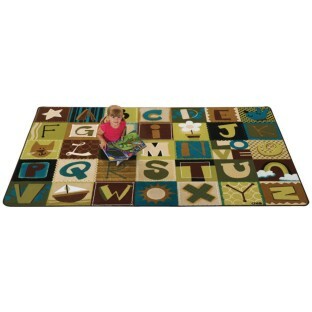 This fun decorative rug in natural colors provides a perfect cozy space for playing, toddling and learning. Anti-static and carpet stain protection. Double-stitched serged edges and Green Label Plus certified. Made in the USA. Lifetime warranty! Please specify size when ordering.